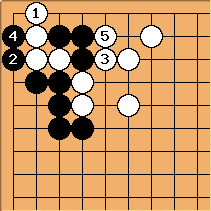 The saying “strange things happen at the one-two point” refers to the fact that the 1-2 points – known as ni-no-ichi in Japanese – have a number of peculiarities which mean that the heuristic principles of fighting along the sides or in the centre often fail in the corner. The 1-2 points are therefore often vital points in life and death problems. The difference between living or dying in the corner is at least 16 points, which should not be taken lightly, as it can easily be enough to swing the game. The 1-2 points are the liberties of the 1-1 points, the only points with only two liberties; this fact makes a play at 1-2 an especially effective attack on 1-1 and is responsible for many of its striking properties. Some peculiarities of the 1-2 point are described in the following sections. 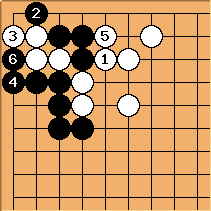 Impossibility to approach a stone at the 1-2 point from the corner 1-1 point. This can give the player who occupies the 1-2 point an additional tempo to win a capturing race. The double shortage of liberties situation illustrates this case. 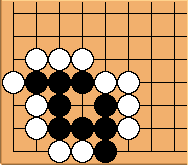 Occupying both 1-2 points is the most efficient way of making an eye, provided that the 2-2 point cannot be occupied by the opponent. This aspect is a recurring theme in many corner life-and-death problems. A ko in the corner only needs five stones. The 1-2 point can often be used to force a ko in the corner at the 1-1 point, such as the bent four in the corner as shown in this diagram. This has ramifications in both capturing races and life-and-death situations. A couple of endgame tesujis also rely on this peculiarity. threatens to capture with the throw-in at the 1-2 point, because of the weakness at a. If White just starts to fill Black’s liberties, Black wins. But if she starts with at 1-2, White wins. 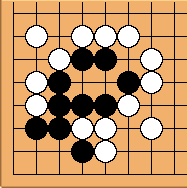 Here Black cannot attack from either side because of shortage of liberties. 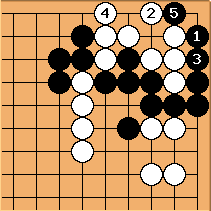 Black played as a ko-threat. I will not discuss whether this was the best threat. 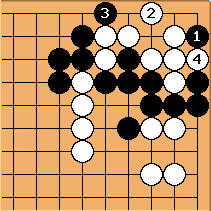 White answered at giving Black another threat at a. 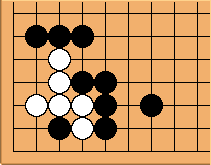 White should have played at a. Here was in answer to , which it also directly threatens. The throw-in , at the 1-2 point, captures , because of the weakness at a. 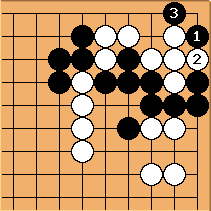 Actually, I can point to a stupid player with White who lost a ko because of this very mistake. It was a certain HolIgor (IGS 5k*). The 1-2 point is a place where many kos happen. 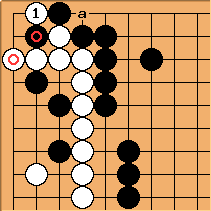 For example, the ko that HolIgor (IGS 5k*) lost. 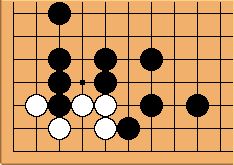 Black plays hoping for White’s mistake. 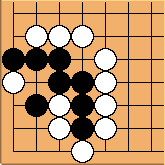 White sees the ko. White suspects that she wins the capturing race without ko (but it is so difficult to read 8 moves ahead, shame on her! ), and she decides to fight the ko. But the sad story of White’s mistake has little to do with the topic of this page, the 1-2 point. 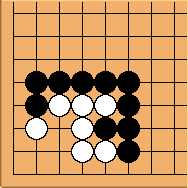 By taking it, Black got a ko that saved his group. tderz: From WeiQi the predecessor of WeiQi TianDi, 1980, Nr. 4, p.31 and, of course, some other famous sources.. In all problems Black has sente.